I let them simmer/boil for about 15 minutes. After draining the potatoes and picking out the bay leaves, I put the potatoes and the garlic in my mixer with half a stick of butter and 4oz of softened cream cheese. I know, not exactly low cal, but OH SO GOOD. I put the potatoes back in the pot on low heat and moved on to the chops. 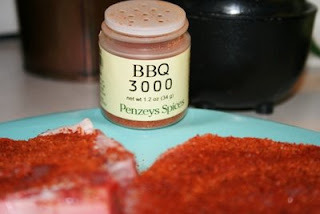 I had already dry rubbed them with Penzey's BBQ 3000. I really like this spice blend. I have tried it on beef and chicken as well, and it always lends a very nice flavor. It does contain salt, so when I use it, I don't salt the meat in addition to the rub. After letting them sit while I made the potatoes, I heated a 12 inch skillet over medium heat and added a few tablespoons of olive oil. 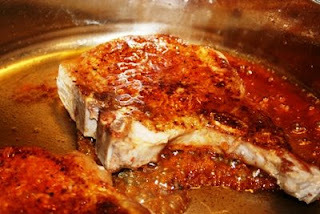 When the oil was nice and hot I added the chops and let them sear on the first side about 5 minutes. Then I flipped them and let the other side go about 4 minutes. Meanwhile, I glazed them with some home made jalapeno jelly Dev made over the summer and preheated the broiler. After the 4 minutes, I slid the skillet under the broiler and let the glaze get a little dark. When it was all said and done, I piled some mashed potatoes in the middle of the plate and popped one of the chops on the top. I'm telling you, this was insanely good. The chops were cooked perfectly and were so juicy I couldn't believe it. If you aren't a pork person, try this with some bone in chicken breasts. I bet it would be equally fabulous!!! 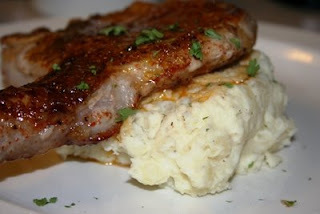 Mimi, I have pork chops on the menu for tomorrow night and I am going to give these a try! I have made the mashed potatoes with garlic and cream cheese before and they are out of this world! 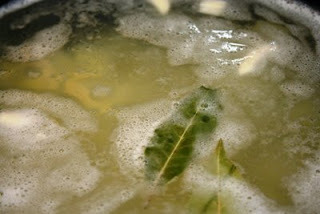 I will try the bay leaf too. And this stuff was purchased with your gift certificate...so in a way you are partly responsible for the BEST PORK CHOPS IN THE WORLD! Hey, very cool that you're a NICU knitter too. That's great! Gives me a warm fuzzy to find others of "us" out there. I just discovered your blog, and it is great! We hope to move to the SLV someday, so it is interesting to read about what's going on there from the perspective of someone who is fairly new to the area. Your recipes look fabulous, too!! Wow! Those pork chops look great!! !